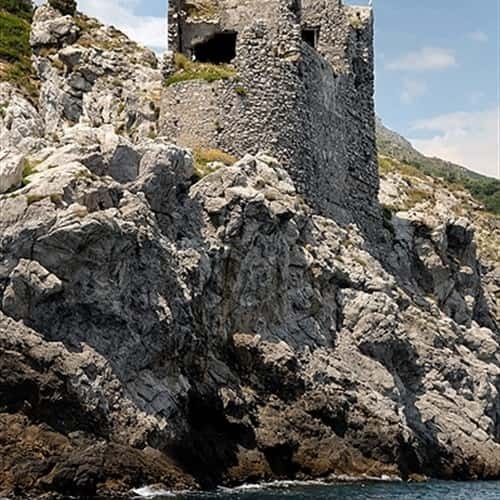 Departing from Maiori's dock, follow the beach on a boat until the Norman Tower (Torre Normanna). At the base of the bastion, on the western side, there is the Sulfur Grotto (or "Grotta Suffregna"), where you can find a spring of volcanic water used in the past for therapeutic purposes, especially for many skin diseases and for its depurative properties. If you don't like the smell of sulphur, you can drink it adding some lemon drops. Continuing the navigation, we arrive at Salicerchie Bay, whose name probably derives from its circular shape or from the "Plaiaquerqua", a centuries-old oak tree that once stood there. Soon after we arrive first at the Pannona Grotto (or Pandora Grotto), with its magnificent stalactites, and at Cala Bellavaia, also called "Beach of the Dead Horse": the savage beauty of the landscape is really stunning! The boat trip continues at the rock stretch called "Badia Tower" and, once trespassing the Catacombs of Santa Maria de' Olearia, the wildest stretch of the coast begins: a steep and sharp rock ending at the Capodorso promontory where, among ravines, pinnacles, vegetation and rock stands the bear's head (a capa r'orso) that gives its name to the place. After Capodorso we find Punta del Tummulo, where there as the so called "beach of the lovers" and the ruins of the tower with the same name. The place name derives from the burial of the soldiers died during the Battle of Capo d'Orso, fought in 1528 between the French fleet and the Imperial Army of Charles V. Once trespassing the promontory, horribly disfigured by the ILVA mining activity (from 1912 to 1965) we arrive to Erchie (Maiori's hamlet) with its beautiful Cerniola Tower, built in 1278 by Charles I of Anjou. After the tower there is the Cauco Beach, a small beach with crystal clear sea water, ideal place for nature and solitude lovers.